The Mil Mi-8V is a 28-seat multi-role transport helicopter powered by two Izotov turboshaft engines. The Mil Mi-8 (NATO reporting name 'Hip') was evolved from the piston-engined Mil Mi-4. On 24 June 1961, the prototype flew first, powered by a single 2700 shp Soloviev AI-24V turboshaft mounted above the cabin. 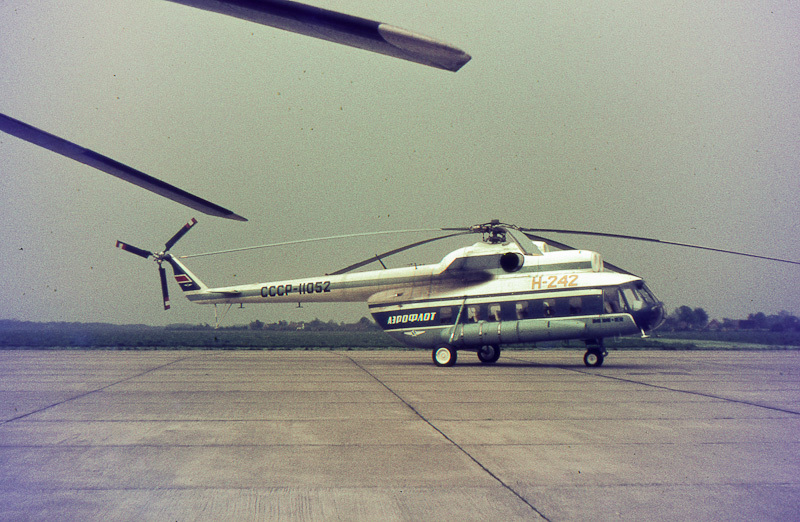 The 4-blade rotor system was generally similar to that of the Mil Mi-4. The second machine, with the single Soloviev supplanted by a pair of two 1400 shp Isotov TV2-117 turbines, flew first on 17 September 1962. In 1963, the 5-blade rotor that became standard for the production machines replaced the 4-blade rotor. The Mil Mi-8 has a basic crew of two with provision for a third crewmember, a cabin for 28 passengers or, in the ambulance role 12 casualty stretchers and two medical attendants. The Mi-8 was exported to over 50 countries. In 1981, the Mi-8 was replaced in production by the re-engined Mi-17 that was flown first as Mi-8MT in 1980. Over 12000 Mi-8s and Mi-17s were built. In June 1967, five Aeroflot helicopters came in at Groningen Airport Eelde for fuel for the planes and food for the crew on their way to the Paris Air Show (Salon International de l'Aéronautique et de l'Espace) at Paris-Le Bourget in France. In companion of Mil Mi-8V CCCP-11052 were Mil Mi-6P CCCP-58647; Mil Mi-6V CCCP-06174; Mil Mi-10K CCCP-29115 and Kamov KA-25 CCCP-21110. Mill Mi-8V c/n 0403 CCCP-11052 was built by the Kazan factory 387. Due to the cold war, the Soviet participants of the Paris Air Show flew over Scandinavia and Holland and Belgium on route to Paris. On the return flight, afterwards the Paris Salon, they stopped again at Groningen Airport Eelde in the Netherlands. The Mill Mi-8V CCCP-11052 entered Soviet military service and was seen in drabbrown camo as '38' yellow in 1993.